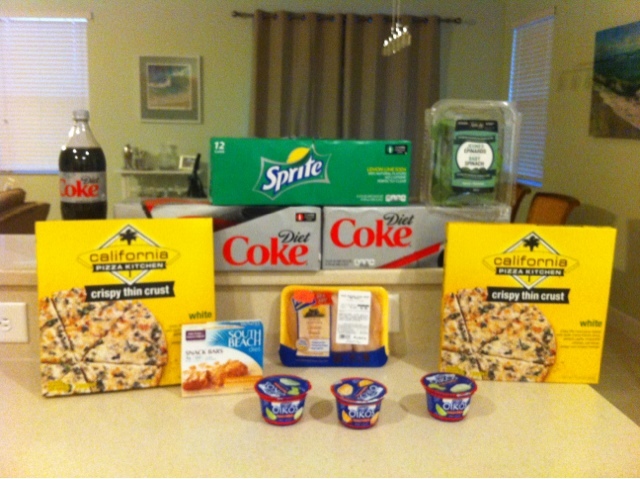 This trip was from the end of last week's sale cycle and I ran into the store yesterday to take advantage of the California Pizza Kitchen deal and the Coca Cola sale too. I am hoping to head to the store Sunday night to do my trip for the new sale cycle. Yes, I know Sunday night is the Super Bowl but since I don't even know who is in it, I figure it will be the perfect time to have Publix all to myself. This trip was just enough to use a $5/$30 Winn Dixie coupon and it was nice to be able to grab some chicken and salad to get Justin through the weekend while I am out of town. I only spent $9 out of pocket at Publix this week so even after Justin stops by the produce stand tomorrow we will be very under budget for the week.